Based on a true story, Lawless delves into the class divide of Prohibition-era Virginia and the American dream, thrust in the faces of those who faced the impossibility of achieving it. 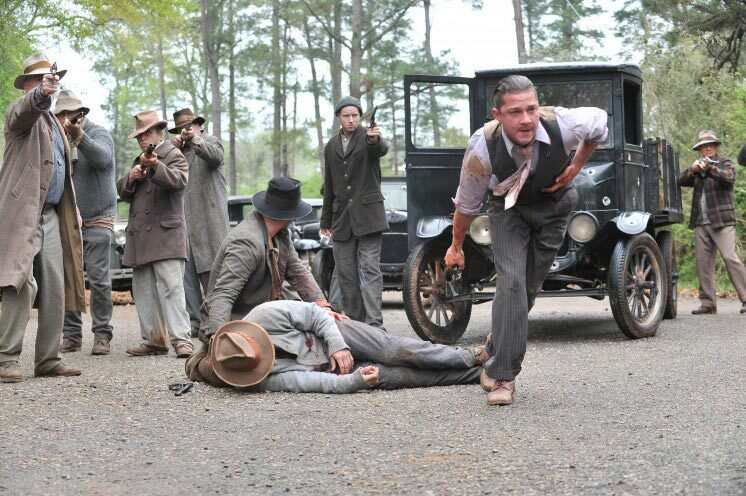 The film is centred around the three Bondurant brothers – Jack (Shia LaBeouf), Forrest (Tom Hardy), and Howard (Jason Clarke); each different in nature, but who all mix together well and convincingly. The three are involved in bootlegging liquor and generally get away with it, until ‘Deputy’ Charlie Rakes (Guy Pearce) shows up to enforce the law. When the local authorities catch wind of Rakes’ plan to show tough brother Forrest his place in line, we learn of the legend that Forrest is ‘immortal’. Guffawing at the notion of invincibility, Rakes responds, “Do you have any idea what a Thompson sub machine gun does to a mortal?” and with that, war is waged. Cue ruthless gore and gunfights that will have even the most resilient viewer squirming. The only time you might have the chance to relax is during the occasional move away from violence, to the film’s development of human relationships. When city girl Maggie (Jessica Chastain) begins working as a bar waitress for Forrest, one scene sees her removing his hat from the table to the chair. He quickly moves it back to its original spot, a humourous move that envelops his wariness at letting outsiders in, as much as it marks her obvious interest. It is an important nuance running in tandem with the other subtleties that play out as an undercurrent beneath the violence. For example, a handful of charming scenes between Jack and his friend Cricket (Dane DeHaan) , and at a later date, his love interest Bertha (Mia Wasikowska), show the characters experimenting with the camera, a new invention that underlines the major technological changes taking place against the main backdrop. That was the thing that struck me with this film; its historical accuracy – in most scenes, the brothers are seen swigging thick, glass bottles, in accordance with the fact that illegally involved citizens shadily consumed moonshine (illegally distilled liquor) whenever they could. Another point that is picked up on is the fact that so many people died drinking the liquor because of mistakes made with its ingredients, and in one scene, Jack ‘busts’ out of church with the need to throw up for this reason. Add billboards about seeking the American dream, and people drinking from water fountains marked ‘White’ and it seems that writer Nick Cave has left no contextual stone unturned. My only very, very small gripe is with the ending. On the one hand, it provides a consolation for the oppressed; on the other, I can’t help wondering whether a conclusion consistent with the plotline would’ve evoked a better emotional response. But overall, this film manages to fit in an affecting exploration of brotherhood, love, and friendship amidst encapsulating the spirit of the time and telling a gripping story. This is a fantastic, no holds barred movie, meant for those who appreciate a raw story in its entirety (and with a little light relief thrown in).